I came home today to find out that I have no more dog food. So for a moment there I had a mini panic attack cause I had to go out in a while so I had no time to get dog food and I didn’t wanna let my dogs starve. So I decided to cook for my dogs. Today was gonna be their lucky day. I boiled 2 cups of rice, chopped up 2 carrots and 2 potatoes into small pieces, microwaved 2 inches of canned dog food (It melted into a thick gravy like mixture). And mixed it all together in a huge bowl. 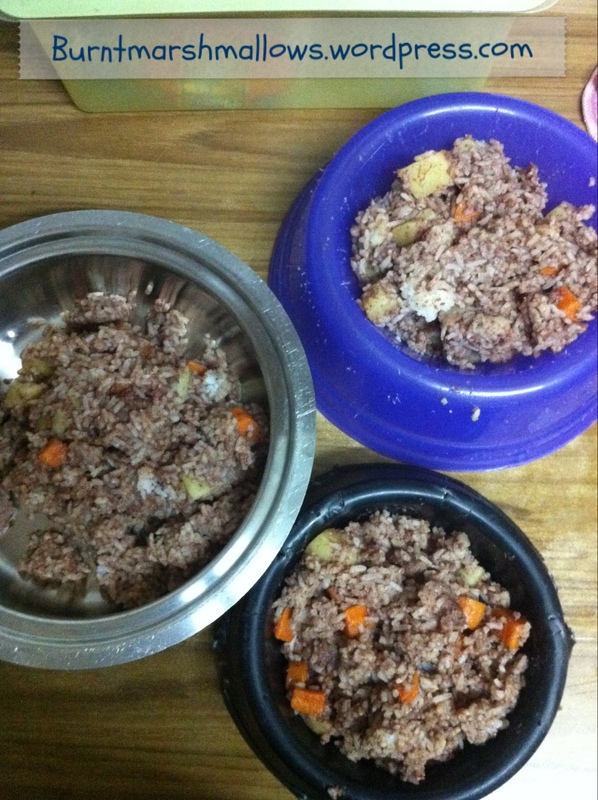 My dogs, they loved it and ate it all up in minutes. The time from when I put the bowl on the floor and walked into the kitchen and back out was all it took for then to finish their food.